Dubai, UAE – September 06, 2018: Over 200 key industry leaders gathered from across the GCC, witnessed path-breaking insights unfold across two-power packed days at the inaugural Corporate Restructuring Summit. Convened by Middle East Global Advisors, a leading financial intelligence platform spearheading the development of knowledge-based economies in the MENASEA markets, The Corporate Restructuring Summit (CRS) 2018 – the GCC region’s first Debt Restructuring and NPL-focused Summit, was held at the Sheraton Grand Hotel in Dubai, UAE. Addressing the theme of “Optimal Management of Financial Restructuring & Non-Performing Loans”, the summit’s vision is to facilitate an enabling environment to address the key challenges of restructuring and strategic reorganization of finance and debt-related issues. The critical insights thus gathered will thereby enable organizations with new perspectives to effectively tackle corporate credit challenges. Renowned Industry Regulator H.E. Dr. Fahad Alshathri, Deputy Governor – Supervision, Saudi Arabian Monetary Authority, delivered the opening keynote address at the conference and stressed on the state of the credit landscape in Saudi Arabia based on prudential reporting. 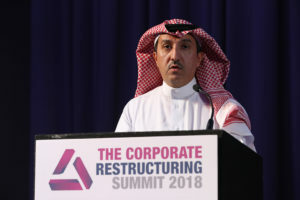 One of the key highlights of the summit was the exclusive interview with Simon Charlton, Chief Restructuring Officer & Acting Chief Executive Officer, Ahmad Hamad Al Gosaibi & Brothers, on the financial restructuring of the Al Gosaibi Group – one of the biggest corporate restructuring cases in the MENA. The two-day summit was moderated by Talat Z. Hafiz, Secretary General – Media & Banking Awareness Committee, Saudi Banks, and key highlights included an exclusive presentation on Secured Transactions – Key Pillar of Modern Financial Infrastructure by Murat Sultanov, Senior Financial Sector Specialist, Finance Competitiveness & Innovation (FCI) Global Practice, World Bank Group; a presentation on The Interplay between the Economy, Finance & Corporate Restructuring by Carla Slim, Economist MENA, Financial Markets, Standard Chartered Bank, and a host of panel sessions focused on resolving GCC’s challenge of accumulating bad debts, impact of non-performing financing on Islamic banks, debt-to-equity swaps, effective management of NPLs, facilitating optimal multi-creditor out-of-court workouts & trends in consolidation, among others. The Summit brought over 200 prominent banks, corporates, legal-advisory firms, hedge funds, investment banks and debt restructuring specialists from across the GCC onto one platform by spearheading actionable debate, impactful change and high-level outcomes. Partners at CRS 2018 included: Eyad Reda Law Firm, Resolute Asset Management, Houlihan Lokey, Borrelli Walsh, Kroll & Alvarez & Marsal. CRS 2018 was held on the 5th & 6th of September at the Sheraton Grand Hotel, Dubai. The Corporate Restructuring Summit (CRS 2018) is an initiative of Middle East Global Advisors, the first of its kind that aims to explore innovative approaches to corporate debt restructuring and NPL management in context of the complex market dynamics in the Middle East North Africa (MENA) region. The summit will gather banks, corporates, legal-advisory firms and debt restructuring specialists from across the GCC onto one platform by spearheading actionable debate, impactful change and high-level outcomes. Middle East Global Advisors is the leading gateway connectivity and intelligence platform to Islamic finance opportunities in the rapidly developing economic region that stretches all the way from Morocco in the West to Indonesia in the East- The Middle East North Africa Southeast Asia (MENASEA) connection. For 25 years, our exclusive focus on achieving business results for the Islamic finance industry has enabled us to create significant value for the leading players in the Islamic banking, finance and investment markets. أعلنت جمعية مصارف البحرين عن تشكيل لجنة تنسيقية مكونة من عدد من كوادر الجمعية وممثلين عن الشركاء في تنظيم منتداها المصرفي السنوي الذي يقام 31 أكتوبر القادم برعاية مصرف البحرين المركزي تحت عنوان «التكنولوجيا المالية: الفرص والتحديات في الصناعة المصرفية في مملكة البحرين». هذا ومن المتوقع بحسب بيان من الجمعية أن يستقطب المنتدى أكثر من 500 خبير مصرفي، منهم ممثلين عن 52 بنكًا ومؤسسة مالية أعضاء في جمعية مصارف البحرين.